I'm really not that into beauty. Re-stocking my make-up bag is often more of a chore than something I look forward to (mostly due to the price of beauty products) and I really don't know much about how to apply make-up well. Skincare, on the other hand, I find really interesting. Trying out new skincare products is something I enjoy because it's just so satisfying seeing improvements in my skin. If the choice was between a new cleanser or a new pair of jeans though, I'd be happy to stick with a crappy cleanser for a while. Fashion is my favourite thing to spend money on without a doubt. So I never thought I'd be as excited as I am about a beauty brand until I discovered Glossier. 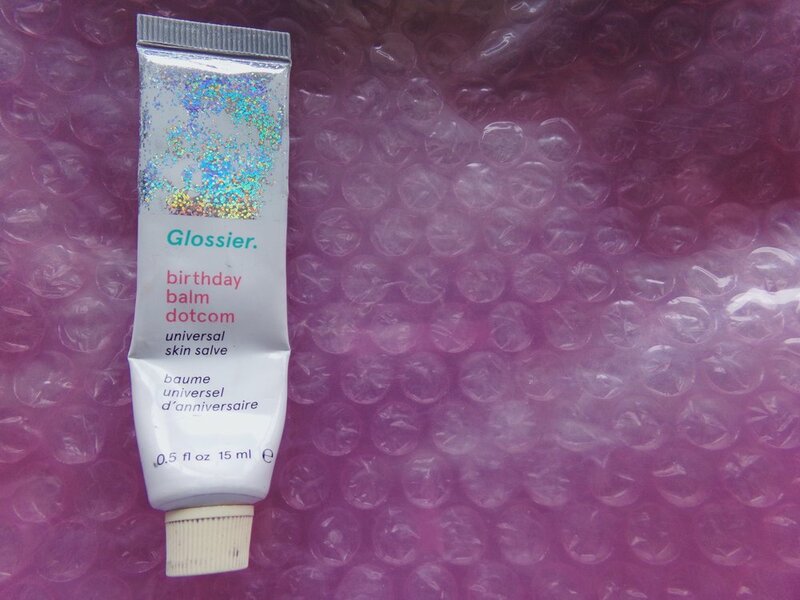 I don't know what it is about Glossier that gets me so excited. I mean, I'm not going to lie, their incredible marketing definitely lures me in and, to be honest, I'm okay with that because I'm definitely more likely to be excited about a beauty product if I like the packaging (or if said product comes with stickers!!) even if that is a little vain. I'm also okay with being consciously allured by their branding because I don't dislike any of the products I've tried and some of them, I absolutely love. I'm really behind the brand's ethos 'Beauty Products Inspired By Real Life' and the effortlessness they ensure their products provide because, as I said, I'm not one to get particularly excited over make-up and I'm pretty crap at applying it so the simpler for me, the better. Plus, they're cruelty free! Since Glossier started shipping to the UK in October 2017, I've accumulated and tried out a fair amount of their products. 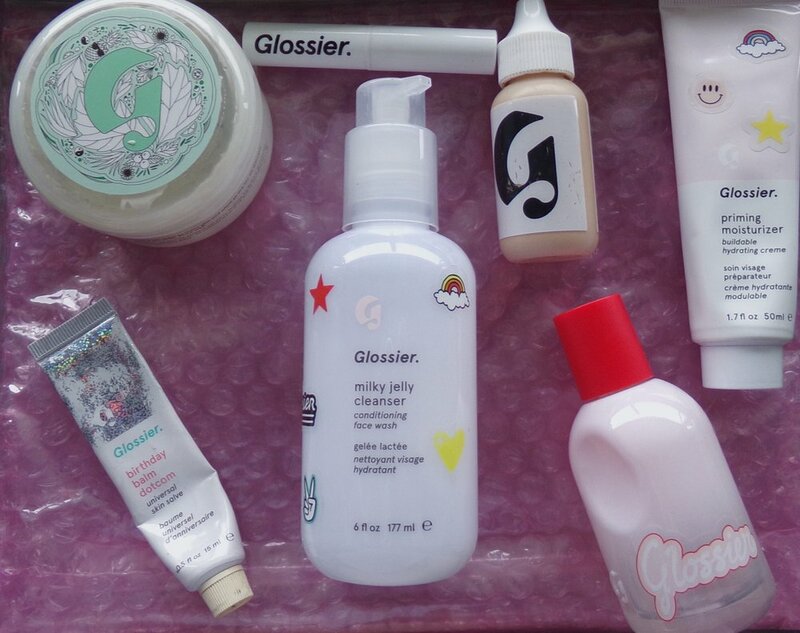 So, seeing as I love their brand so much and have tried out rather a lot of their products, I thought I would rank them and talk a little bit about the pros and cons of each of them, in case you're looking to make an order from Glossier and aren't sure what to buy. My number one Glossier product has to be this cleanser. It hasn't transformed my skin by any means but it is the cleanest, most refreshing cleanser I've ever used. I love using it in the shower in the morning as the texture and the smell really help to wake me up. It's also nice and light which makes it perfect to use in the morning as well, because I don't like to pile on too many heavy products before starting my day. I always look forward to using this cleanser and it is by far my favourite cleanser I've ever used- I'm already on my second bottle. I've never attempted to take my make-up off with it because I've read lots of reviews that say it isn't great for that and I did initially use it in the night, but then swapped it for the Mario Badescu Enzyme Cleansing Gel, because I felt like it was a bit too light for my evening skincare routine. This is the only thing about the cleanser that I'd described as a 'con' but really the fact that I don't use it in the night is just personal preference and the because I own two cleansers and like to get my use out of both of them. This lip balm (or universal balm, as Glossier describe it) is so so great! It smells amazing, it hydrates my (extremely dry and often chapped) lips and the packaging is perfect. The only reason it's not at the top of my list is because it's unfortunately not vegan and I only purchase vegan beauty/skincare products (this was gifted to me and I use up all my gifts rather than letting them go to waste). It's such a shame because this really is the perfect lip balm and I'm very very tempted to re-purchase it once it runs out even though it isn't vegan. But I'll cross that bridge when I come to it (which will hopefully be never)! I was kindly gifted this perfume for Christmas and it has become my staple scent ever since- I mean, it's the only perfume I own so I don't really have much of a choice but I do genuinely love it and I know I would reach for it pretty much every day anyway even if I did own any other scents. This perfume is designed to smell different on everyone who uses it and the scent does feel very natural to me. If I could describe how I want to smell then I would describe this. I'm really not even going to even try to describe the scent because I really know nothing about perfumes so that would be totally pointless. But if you order anything from Glossier you can add a sample of the perfume to your order for free so you can try it out yourself. I would definitely recommend it as I always feel great when I'm wearing it and consistently receive compliments on it when I do. First of all, sorry for the very crappy quality of this photo. I somehow lost the photos of this mask (and photos of the lipstick a little bit further down the page) and had to re-take them without natural light so I could get this blog post up in time and my camera's focus is not great without natural light (or even in natural light to be honest). Anyway, I've been using this mask for a few months and I've definitely noticed that my skin has improved. I started using a variety of new skincare products all at the same time though, so I can't be sure that it was this mask that has significantly improved my skin, although I do genuinely feel like it's helped. It stings a little while it's on my face, which I like because then I know it's doing something, and my skin is visibly brighter after removing it. 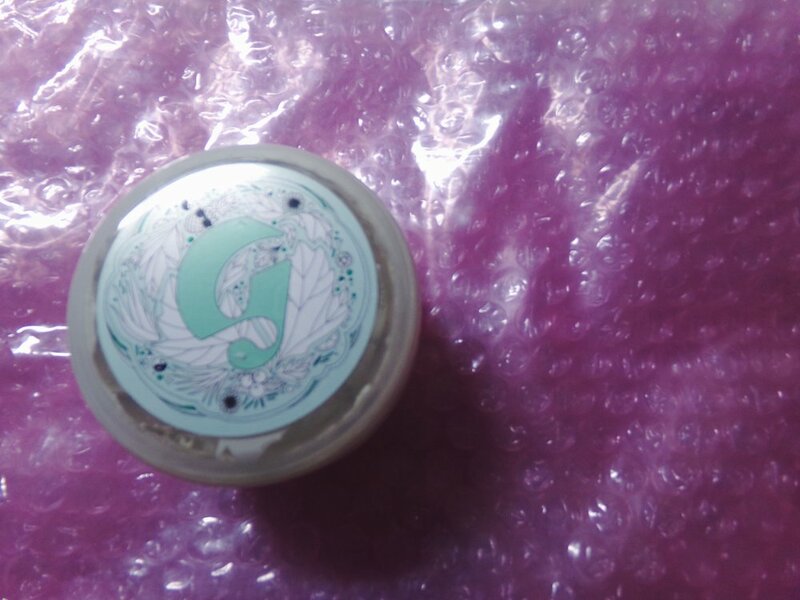 I also really like the packaging because, even if tubs aren't the most hygienic form of packaging, I feel like I can use every last drop of the mask and am able to easily apply the right amount of mask to my face too. I don't know if I'd re-purchase this mask because it's not dramatically transformed my skin and I do like to try different masks because I find it fun/interesting. So I can't say I am totally besotted with this product but it's definitely worth trying. This, along with the milky jelly cleanser, was the first Glossier product I purchased back in October and I've been using it as my base for make-up ever since. I really loved it at first. It's super natural as in, it provides little to no coverage. But I really like this because I prefer a natural make-up look anyway and I don't like how heavy foundation feels on my skin. I apply it with my fingers (which definitely works best because using an applicator means losing a significant amount of the product) which makes it super easy to apply and it's pretty much impossible to get foundation lines- so it's great in terms of ease. However, as I've got further through the product, I've been becoming more and more frustrated with the packing because it's so difficult to get any of the product out of it. I also think it's really overpriced for what it is and, after recently purchasing The Ordinary Serum Foundation, I think I much prefer the latter that I bought for a fraction of the price. So I don't think I will be re-purchasing this foundation purely because of the price and the packaging but it did work well for me for a period of time. Again, sorry for the crappy quality of this photo. This lipstick is the most recent of my Glossier purchases and I do really like it. It's a nice shade of red and it's definitely buildable. However, it's just not really what I expected. I was hoping for a more natural red and one that wouldn't budge as easy as other red lipsticks do. I don't really think it's lived up to these expectations and isn't much different other red lipsticks I've tried but it is great for a standard matte red lip and one that was definitely missing from my collection. In last place is the priming moisturiser. This just wasn't for me. As mentioned, I have oily skin and this moisturiser, in my opinion, isn't great for my skin type at all. I'm sure it would be great for people with less oily skin as it's super convenient in that it's a primer and moisturiser in one. I have tried it a few times underneath the Perfecting Skin Tint and it definitely improved the appearance of my skin for the first hour of wearing it, and helped the foundation to go on much more smoothly. However, after this hour, it would really just highlight my oiliness. So, not great for me, but it might work for you! So we've reached the end of this fairly *comprehensive* (AKA rambly) post about the Glossier products I own. Please do let me know if you have any questions about any of the products I've mentioned. Or, if you've tried out any of Glossier's products, I'd love for you to recommend me your faves in the comments. Next on my list to buy is the Solution, closely followed by at least one shade of Lidstar. You can also click here to use my code to get 10% off your Glossier order (and if you use it, Glossier reward me with some store credit- which is nice for the both of us)!